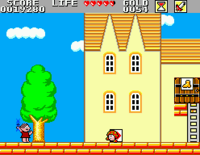 Mônica no Castelo do Dragão is a retooled version of Wonder Boy in Monster Land released in 1991, exclusively in Brazil. 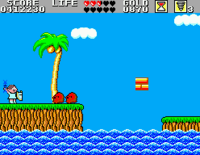 Authorized and licensed by Sega, it was produced by Tec Toy together with "Maurício de Sousa Produções" to suit a Brazilian audience, using popular national characters. 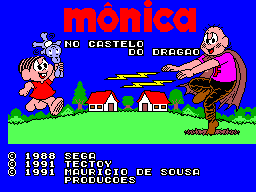 This version features Mônica, a character from the popular Brazilian children's comic Turma da Mônica (Monica's Gang in English), created by the cartoonist Maurício de Sousa. 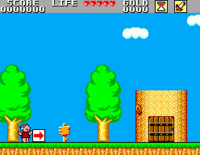 This was the first Master System game to receive this type of localization treatment from Tec Toy - several others would follow in the next years. 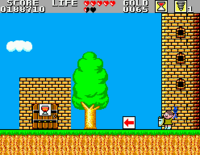 In April 1992 the game had an adapted version published in the issue 64 of the comic book Mônica, on which Capitão Feio (the villain seen in the game's title screen) appears in the end to fight Mônica. This story was available online for free for a while, both in Portuguese and in English, but is currently offline, although the Portuguese version can be read through the Wayback Machine. “ Capitão Feio, Master of the Sewers, one of the most terrifying villains that comics have ever known, has the dream of conquering the world to leave it dirty and polluted. To achieve this goal, he gathered a powerful army of monsters, having the evil dragon Cospe Fogo as his right arm. By surprise, the monsters attacked and dominated everyone. Now, only one person can defeat Capitão Feio and his allies: our little friend Mônica. To overcome the bad guys, Mônica can count on the help of her bunny Sansão, and friends who will give her rest, sell weapons, and share valuable information. If Mônica fails, she will become a monster of dirt. She will need a lot of your skill, determination and courage, to free the world from the monsters and make Capitão Feio go back to the sewers! 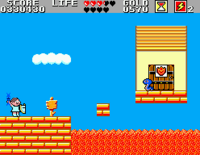 The original game mechanics and commands remained untouched: open doors and climb stairs, throws bombs, use special weapons and go down stairs. 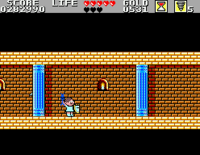 stabs the enemies with the main weapon, which in this version is the bunny Sansão instead of a sword; jumps and leave buildings faster. brings up the status window, which shows your points, gold, equipment, potions and so on. Killing monsters, passing through obstacles and collecting treasures grant you points and reaching multiples of 100,000 adds extra hearts. Getting hit or falling onto dangerous kind of grounds such as lava makes your health, represented by little red hearts which become black in your status bar, go down and you lose a life once all of them become black. 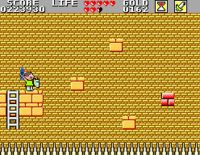 The gold collected during the game, in the form of coins and bags, can be used to purchase equipment as well as other useful items. First round is pretty short and easy, with the monsters being very weak and most of them immobile. Boss(es): Dona Foice (drops key and coins). Buildings: (1) NPC who hands in the initial sword, (2) Bar, (3) Boss. Second round is longer, split in 3 parts and slightly harder since almost all enemies can walk or fly into you. Enemies: Chapéu de Sapo, Cobra, Duende Zim, Morcego Fang. Boss(es): Demian (drops weapon), Jenifer (drops key). Buildings: (1) Shoes Shop, (2) Bar, (3) Shield Shop, (4) Item Shop, (!) Hidden NPC, (5) Demian, (6) Shoes Shop, (7) Hospital, (8) Jenifer. Third round is still easy and has 3 parts too. Most enemies are floating ghosts that are easy to kill, one of them that guards a long ladder can be annoying and must be lured away though. 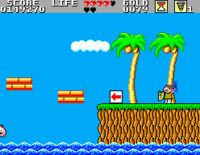 Enemies: Bolha, Cobra, Urutu, Chapéu de Sapo, Duende Zim. Boss(es): Conde Malvado (drops only coins). Buildings: (1) Bar, (2) Item Shop, (!) Hidden Armor Shops, (3) Conde Malvado. Fourth round has two parts, plus a secret one. To access the secret area, after facing the Escórpio, get on top of the first platform, drop down between the two platforms and hold the left button to make sure you land on the spot where a secret shop is at. Enemies: Glub, Escórpio, Alee Rato, Octopus. Boss(es): O Coisa (1st time: drops key and coins / 2nd time: drops coins and a Coração Grande). Buildings: (1) Armor Shop, (2) Hospital, (3) Bar, (!) 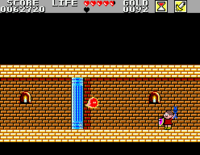 Hidden NPC, (4) Shield Shop, (Secret Area) Medicine Shop, (5) O Coisa. Fifth round gets a little harder, with flying and ranged enemies (not a big deal if you own a shield). Enemies: Duende Zim, Cobra, Morcego Vamp, Homem Lama, Duende Zom. Boss(es): Bing Bong (drops weapon). Buildings: (1) Bar, (!) Hidden Boss, (2) Armor Shop, (3) Bar. Sixth round is a nightmare for beginners, with floating platforms, deadly sharp spikes on the ground and annoying ghosts. There's also a secret shop around the end of the first part. It's also worth noting that the boss can be skipped if you answer his question correctly. Enemies: Junior Foice, Serpente, Urutu, Master Rato, Alee Rato, Vegetarius. Boss: Duque Armadura (drops only coins). Buildings: (!) Hidden Shop, (1) Hospital, (!) Hidden Armor Shop, (!) Hidden Shoes Shop, (2) Bar, (3) Boss. Seventh round is kind of long having 4 parts. The 4th part is optional but it's recommended to explore it. Enemies: Master Rato, Serpente, Bolha, Glub, Escórpio, Super Bolha, Escudeiro de Bronze. Boss(es): Mama Foice (drops weapon), Sir Aço (1st time: drops key and money bags / 2nd time: drops money bags and a Coração Grande). Buildings: (1) Shoes Shop, (2) Armor & Item Shop, (3) Bar, (4) Hospital, (5) Mama Foice, (6) Info NPC, (7) Sir Aço, (!) Spot to use the Flauta (flute) if you acquired it previously, (!) Hidden NPC that trades a Estrela Mágica (star charm) for your Flauta. Eighth round is also split in 4 parts and features 2 bosses. Around the middle of the 1st part you must choose if you wanna go to the 2nd or 3rd part, by falling down a pit or not. If you fall down, you cannot access the 3rd part where the 1st (secret) boss is at. Enemies: Bolha, Homem Lama, Alee Rato, Duende Zom, Escudeiro de Bronze, Super Bolha, Vegetarius, Mega Foice, Morcego Vamp. Boss(es): Feiticeiro (drops a spell item), Medusa (drops key and money bags). Buildings: (1) Bar, (!) Hidden Optional Boss (Feiticeiro), (!) Hidden Obligatory Boss (Medusa), (2) Misc Shop. Ninth round has 3 parts and 2 bosses. 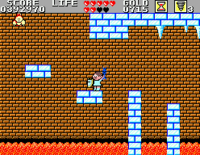 The 1st and secret boss is accessible around the end of the 2nd part, a vertical descent to the bottom of a cave. It's a good choice to beat him since he drops the best weapon of the game. 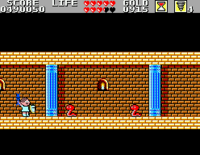 Enemies: Serpente, Duende Zom, Morcego Vamp, Homem Lama, Super Bolha. Boss(es): Super Demian (drops weapon), Porco (drops key and money bags). Buildings: (1) Shield Shop, (2.1) Bar, (2.2) Armor Shop (reachable wearing a pair of Botas Mágicas), (3) Armor Shop, (!) Hidden Boss (Super Demian), (4) Porco. Tenth round is split in two parts only, that are full of ice and lava (no, you didn't misread). Enemies: Serpente, Junior Foice, Morcego Vamp, Glub, Mega Foice, Escórpio, Octopus. Boss(es): Sing Song (drops money bags). Buildings: (1) Shield Shop, (2) Armor Shop, (3) Shoes Shop, (4) Misc Shop. Eleventh round is quite long, having 5 parts. Enemies: Vegetarius, Octopus, Escórpio, Homem Lodo, Mega Foice, Morcego Vamp, Escudeiro de Aço. Boss(es): Sir Prata (drops key and money bags). Buildings: (1) Bar, (2) Shop and a secret NPC (if you have the Estrela Mágica), (3) Bar, (4) Armor Shop, (5) Misc Shop, (6) Hospital, (7) Shoes Shop, (8) Sir Prata, (9) Misc Shop, (10) If you've explored everything up to now you can buy either a Sino or a Pedra mágica. Twelfth and last round is almost as long as the other 11 rounds together, challenging and fun. You'll find yourself in a labyrinth where you face many different monsters, which now won't drop any money since there are no shops anymore. 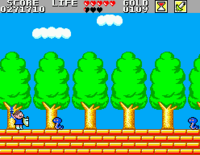 Enemies: Cobra, Junior Foice, Urutu, Duende Zom, Escudeiro de Bronze, Bolha, Super Bolha, Homem Lodo. Boss(es): Cospe Fogo original form, Cospe Fogo robot form. The game doesn't feature a credits roll, though the above is known from magazine articles and interviews. Bottom-left says: "Free adaptation of the videogame Mônica no Castelo do Dragão"